CITIC Pacific Ltd, an arm of China's biggest State-owned investment company, is leading record spending on low-grade iron ore mines in Australia to profit from surging demand as well as to diversify supply. As much as A$18 billion ($16.6 billion) is being spent on so-called magnetite iron ore projects, 36 percent more than a year ago, according to data from the Australian Bureau of Agricultural and Resource Economics. CITIC Pacific this month said it signed sales accords for its $4 billion project. China is pumping cash into developing the mines as its steel mills are forecast by Rio Tinto Group to consume more iron ore during the next five years than Australia has shipped throughout history. Bankrolling rival suppliers will help counter the market dominance of Rio and BHP Billiton Ltd who are forming a production joint venture in Australia. "If this BHP-Rio joint venture goes ahead, the Chinese will feel even more under threat," said Peter Chilton, who holds BHP and Rio shares at Constellation Capital Management Ltd in Sydney. "There are a lot of small projects on the go. If China takes more direct control of these and promotes them with an Australian partner or on their own, at least it guarantees them extra supply." CITIC Pacific gained 0.47 percent to HK$21.5 yesterday in Hong Kong trading. The stock has more than doubled this year. Rio declined 0.26 percent to A$71.7 on the Australian bourse. BHP gained 2.4 percent to A$41.19. 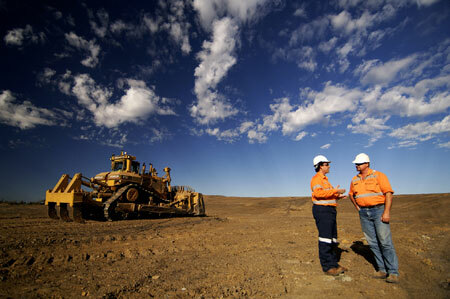 London-based Rio is the world's second-largest exporter of iron ore and Melbourne-based BHP is the third-largest. Baosteel Group Corp and Anshan Iron and Steel Group are among steelmakers helping develop projects to mine the lower-grade ore, shunned by Rio and BHP, who ship higher-grade hematite from Australia, the world's biggest exporter. Prices have more than tripled this decade as demand for steel used in construction, cars and washing machines surged. "The Chinese are prepared to invest in longer-term projects that otherwise would never be built," Evy Hambro, who helps manage BlackRock Investment Management Ltd's flagship $11.6 billion World Mining Fund, said in an interview in Melbourne. "Projects that would not necessarily get banking finance from Australian or European or US banks might now get project finance from Chinese customers or Chinese banks." Australia has two operating magnetite projects at Grange Resources Ltd's Savage River in Tasmania and OneSteel Ltd's Whyalla Steelworks in South Australia. They each produce less than 2 million tons a year, compared with CITIC Pacific's 28 million-metric-ton Sino Iron project. That mine at Cape Preston, 100 km southwest of Karratha in Western Australia's Pilbara region, is scheduled to start in the fourth quarter next year. "It's only the Chinese who can make the magnetite make sense to them at the moment," said Romano Sala Tenna, who helps manage A$35 million at Perth-based Katana Capital Ltd. "They do see the long-term need." Magnetite has higher production costs than hematite because it needs more processing. Hematite ore accounts for about 96 percent of Australia's output, according to Gindalbie Metals Ltd.
To drive the processing plant at its project, CITIC is building a 450-mW power station. That capacity is equivalent to the current energy needs of the entire Pilbara region, which hosts 18 iron ore mines operated by Rio and BHP as well as other mines and towns. The Sino Iron magnetite project "clearly must be seen as a test case for the whole of the industry and Australia," Barry Fitzgerald, chief executive officer of CITIC Pacific's Australian unit, said in an interview. "There's a specific need for our product. China demand will continue." Ore imports reached a record in September and prices may rise 5 to 10 percent next year as suppliers have more pricing power, Nanjing Iron & Steel United Co said on Nov 19.